Empowering quality care, reducing costs, and improving patient experiences. Get started today! Our easy-to-use, intuitive systems start adding value on day one. Thinking About Utilizing Telemedicine In Your Organization? Our team has the answers you need to get started! We are the responsive partner trusted by leading healthcare organizations to provide high-performance medical consultation systems that can increase access to quality care by linking physicians and medical staff with patients via online medical consultations. ProConnections understands the unique challenges faced by hospitals, long-term care & skilled nursing facilities, and other healthcare service providers when it comes to the successful implementation of telemedicine systems. Find out how ProConnections’ solutions can work for your organization. 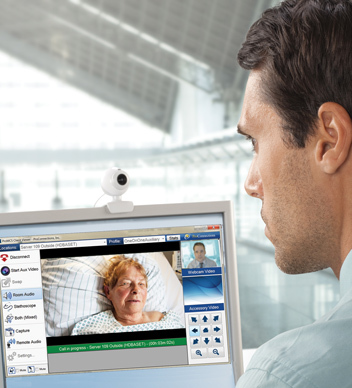 Thinking about utilizing telemedicine in your organization? Let us help you. Proven/Trusted – Over 8,000 ProConnections systems have been deployed in hospitals throughout the country monitoring ICU patients around the clock by a remote medical team. Simple-To-Use – Our Medical Consultation System was developed with ease-of-use in mind. Our intuitive telehealth solutions can be operated by physicians and medical staff without requiring intensive training or support. Cost-Effective – We work closely with you to provide the right-sized solution for your needs and budget while never sacrificing optimal performance. A Responsive Partner – We are a responsive, engaged partner that understands and is able to facilitate what you need in order to successfully implement our telemedicine systems in your facility. to trust to videoconferencing solutions born in boardrooms. Request a demo today! ProConnections has put together a deep roster of powerful foundations and partnerships to help Skilled Nursing Facility administrators find local or private sources of funding. Download this FREE white paper to find out why telemedicine will be essential to healthcare facilities preparing for the changes ahead!